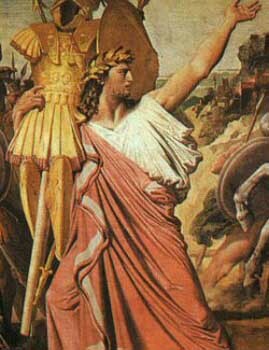 Likewise, Carrier cannot reasonably justify why Mark chose to subvert the image of Odysseus, when other and more logical candidates were available. . . . .
That sounds like we are about to read how Gullotta introduces us into Carrier’s flawed explanation but in fact we find that Gullotta has failed to give Carrier a chance. Gullotta fails to inform readers that Carrier offers a rather reasonable justification for Mark’s comparison of Jesus with the many figures from both Jewish Scriptures and gentile literature: it was all about creating a new identity and a “higher morality” than they all represented. Gullotta may not think Carrier’s justification is adequate, but he needs to explain why and not simply declare, without at least some reference to the contrary evidence, that he cannot do a good job of it. [A]ll of the evidence renders [Dennis MacDonald’s] position of Homeric influential dominance untenable. The ultimate shortcoming of MacDonald’s thesis, and thus Carrier’s use of it. . . . .
By now we have surely offered sufficient citation and evidence to demonstrate that Carrier by no means, not at all, follows MacDonald in asserting that Homer was the “dominant influence” on the Gospel of Mark. Most of Carrier’s argument to demonstrate the literary (non-historical, non-eye-witness) sources of the Gospel of Mark has been squarely grounded in Mark’s use of Jewish Scriptures, at minimum forty pages of in depth comparisons with Jewish Scriptures! Carrier’s references to MacDonald’s comparisons have been very scant by comparison. As I said, I cannot understand why or how Daniel Gullotta could possibly have presented such a palpably false indication of Richard Carrier’s argument. The misrepresentation extends to Gullotta actually conveying the clear message that Carrier did not argue for a predominant influence of the Jewish Scriptures on the Gospel of Mark when that is the diametric opposite of the facts. Carrier’s use of MacDonald’s thesis was minimal yet Gullotta asserts the very opposite of what we must believe he read. I am at a loss trying to find a charitable way to excuse such disrepresentation of Carrier’s argument. Posted on 2018-08-18 10:55:51 GMT+0000 by Neil Godfrey. This entry was posted in Uncategorized and tagged Carrier: On the Historicity of Jesus, Daniel Gullotta, Gullotta: On Richard Carrier’s Doubts. Bookmark the permalink. [S]cholars such as White and Crossan in arguing the use of the Hebrew Bible as a source of Christian inspiration for the life of Jesus, establish the early Christians intimate knowledge of these Jewish texts within their own Jewish matrix, culture, and location. In making a connection between the Gospels and the Homeric literature (Does the New Testament Imitate Homer? ), Dennis R. MacDonald studies the educational practices of the Greco-Roman empire and formulates a solid thesis that anyone who was trained to read and write (which was a extremely small amount of people) would have certainly had contact with the Odyssey and the Iliad. We see these sorts of reversals from time to time. There seems to be a rule: say one thing when addressing one’s peers on questions of interest to one’s peers; say the opposite if it serves the purpose of slamming those who question the very foundations of our work. There is talk in universities of scholars who have been found out having falsified their research, and of students who have cheated. Should Gullotta be exempt from being checked? If we were to find that Gullotta presented a clearly false review of Carrier’s OHJ should his Honors Degree be stripped from him? Neil Godfrey: I seriously think that you should submit this series of blog posts (or at least this one especially) to some more academic source – either the University of Newcastle or the scholarly journal where this review was published. Even if Gullotta was not dishonest in writing this review, he seems to have been so incompetent that other scholars should be informed about it. Gullotta ap. Podcast: “Daniel Gullotta, Mythicism, and Debating David Fitzgerald“. BlogTalkRadio. Logicast. 29 August 2015. Cf. Neil Godfrey (3 September 2015). “Daniel Gullotta’s Followup Podcast on the David Fitzgerald Discussion“. Vridar. [23:20] Gullotta >>> In my studies of mythicism — I am actually not that interested in mythicist theory . . . I fail to see its explanatory power at all. And the leaps and bounds and forced readings they have to put on to the text and the sources — at times frankly it baffles me. [46:00] Gullotta >>> [W]hen you go into the second century for example, and the late first century, if these passages in Josephus and Tacitus and the gospel traditions we get, if they’re all somewhat reliable — even if they’re not completely 100% eyewitness accounts or whatever — these people are promoting Jesus as a man in history, as a Jew, like situated in a certain point of time in recent memory. . . . . It’s not as if he is a figure of the distant past like Hercules — he is contextualized in a very recent part of recent Jewish history. Even within the gospels — if Jesus lived roughly in the 30s . . . and the first gospel is written in the year 70 roughly — Mark. That’s still recent history, that’s still in the local memory.